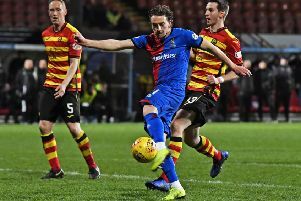 Neilson watched his side reduce the gap at the top of the table to just five points courtesy of Nicky Clark’s 83rd-minute winner after Andy Graham’s first-half own goal had cancelled out Jordan Kirkpatrick’s early opener for Alloa. United now travel to face Dunfermline at East End Park on Tuesday, where victory would see them move to within two points of Championship leaders County albeit with a game more played. 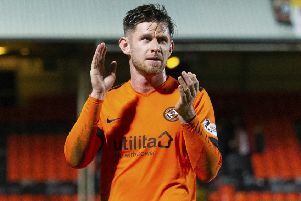 Neilson, whose side have now recorded back-to-back wins at Tannadice, is confident his players are poised to test County’s mettle. “Alloa are fighting for their lives so we had to work extremely hard,” said Neilson. “The lads showed character to keep going. It’s a big ask for the players to go Tuesday, then Saturday and now Tuesday again at East End Park. “It’s another huge game against Dunfermline who will be fresh because they didn’t play today. But this is a huge result as it gives us that chance to get the gap down to two points on Tuesday night. United were buoyed by Tuesday’s 1-0 triumph over County but faced an altogether different type of test against their bottom-of-the-table visitors. The home side were still without Slovakian striker Pavol Safranko, who was away on international duty, and Osman Sowa was out injured. And it was their relegation-threatened opponents who began the brightest and stormed into a sixth-minute lead. Iain Flannigan’s corner was headed back across the goal by Alan Trouten, and Kirkpatrick stabbed it home at the far post past Benjamin Siegrist. However, United levelled matters in 26 minutes. Jamie Robson’s whipped free-kick was glanced on by Clark and deflected off central defender Graham on its way into the net. The hosts pressed to get their noses in front before the interval and Sam Stanton’s low shot from 16-yards was held by visiting keeper Neil Parry. Minutes later, Parry spilled Calum Butcher’s long-range drive as Clark raced in to try and force home the rebound, but the striker was penalised for his troubles. Then, on the stroke of half-time, Alloa striker Dario Zanatta, on loan from Hearts, headed just over from John Robertson’s cross while clashing heads with United defender Rachid Bouhenna. Alloa started the second-half strongly and Graham saw his 64th-minute header from Flannigan’s free-kick saved by Siegrist. At the other end, Parry pulled off a spectacular save to deny Paul Watson’s header from Paul McMullan’s cross. But Clark came to the rescue with seven minutes left as he latched on to Callum Booth’s low cross to stab home from point-blank range and spark scenes of jubilation among the home fans. “It’s a sucker-punch to have nothing to show for our efforts, but we just have to pick ourselves up and keep fighting for survival,” said Alloa manager Jim Goodwin.